DISCLAIMER: HEY CAMPERS! STOP READING! I’ve done 3 summers at camps in America! Some of which were the best summers of my life! If you are thinking of going to camp, I HIGHLY recommend it as it is an experience like no other! You’ll meet friends for life, learn more about yourself, gain skills and have an amazing summer in one of the best countries in the world! 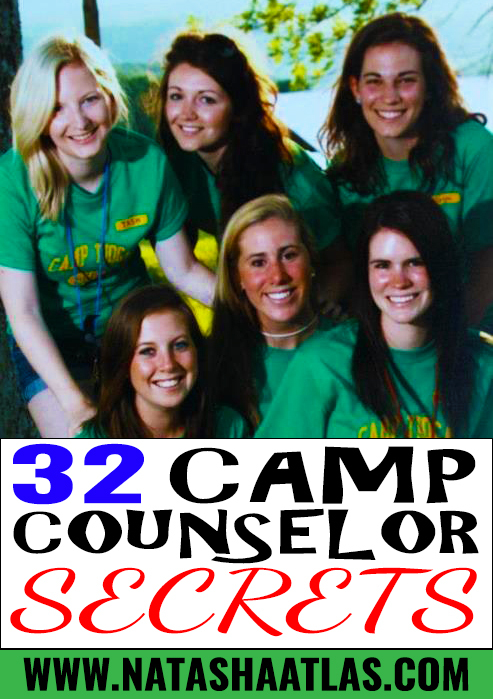 Here’s some tips/secrets to take with you…Let’s dish the dirt on Camp Life! 2. You are not allowed food inside your cabins as it attracts mice etc, but there’s always one sneaky camper who has a secret stash of treats! We always know! 3. Rest hour is the best hour of the day! FACT! 4. You’ll be counting your kids in your sleep! 5. Counselors have code words for everything! 6. The Staff room is your sanctuary! NO CAMPERS! 7. If one of your kids needs to go to the Nurses office, jump at the chance as it means you’ll get an ice-pop! 8. Always remember to do a courtesy flush! Camp plumbing is temperamental! 9. If you are from another country, your kids will take the mick out of it on day 1! But it will give you bonus points with the other staff! 10. You will try to get everyone on your day off into 1 or 2 motel rooms sleeping where ever possible to save money. 11. You will eat as much junk food, fizzy drinks, and sweets on your day off as humanly possible! 12. You will get amazing leg muscles from walking up steep hills to activities everyday! 13. Your anxiety levels will peak when you think you might have lost a child! Epic freak outs and then you realise you’ve just miss counted! 14. There are limited rides available for days off so if someone if late for their day off….daggers….daggers from everyone! 15. You will be humming camp songs on your day off! Camp songs are for camp! Days off are for songs you can’t sing at camp! They will haunt you when you go home too…snap out of it! They will drive you crazy! 16. When your kids really want to go to an activity and you do all in your power to try to get them to change there mind….Why is Fishing an activity???? 17. Bring tea to camp…the tea at camp is not tea! If you forget it, get someone to send you it in camp post! 18. When you realise you don’t actually know the real names of the friends you have made at camp all summer. Then you try to find them on Facebook or freak out at what their actual name is? 19. Being a Color War Captain is the highest honour and so much responsibility! It’s a double edge sword! 20. Getting a letter in the camp post is really emotional because someone actually took the time to write a letter and go to the post office to deliver it for you which would never happen back home anymore…that’s what Facebook is for! 21. I still have no idea where my socks went? Camp laundry is a mystery! 22. There is a mythical creature lurking in the woods or lake in every camp in America! This is to ensure they don’t run off! 23. There’s no P in Pool….it’s an OOL? This is a lie! All my campers have peed in the pool! Sorry Lifeguards! 24. Sometimes your activities are on opposite ends of the camp and somehow your activity leader expects you to get there on time!? 25. When seconds is called “RUN”! But don’t run…the kitchen staff will kill you for running in the hall. Speed walk! That’s not running at all! 26. Pretending you love Meatloaf so your campers will eat it is the hardest thing you’ll ever do! 27. Every summer there will be an outbreak of something! Camps have a “special” ways to wash your hands! Makes sure you and your kids wash your hands all the time!!! 28. Writing Camper reports are never ending and take longer than writing your dissertation! 29. The Kitchen staff are your best friends! THEY HAVE THE FOOD! 30. Your kids will laugh at the way you say Water Bottle everyday! 31. Camps have strict rules to keep the kids safe! Don’t break the rules! 32. Arts and Crafts is the best activity on camp! FACT! You let your kids run wild and you get to make something too…wait! I mean you help your kids make something for their parents which they will instantly throw away when they get home. Wait! I mean…yeah it’s a free hour to make a mess and pretend to clean up….Wait! Sorry Art department!!!! One last tip from me to you…when your campers make you dress up as a guy for camp activity…keep an eye out for that sneak camper trying to draw hair on your legs with sharpy!!! Or you’ll look like you have hairy legs all summer! Have you been to camp? Relate to any of the above? Let me know in the comments below! This sounds like great fun, it’s really interesting to hear about all of this – I’ve never been involved in camp so I love this little insight! Every Single One Is So RIGHT! Brings back a lot of camper/counselor memories.